Mr. Landon is a seasoned executive with experience in banking and finance, education, professional services and not-for-profit leadership. Al currently teaches business leadership and banking courses and helps develop experiential learning programs at the University of Utah. 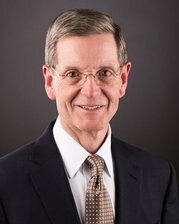 He also directs the Utah Center for Financial Services. Al is a Director of State Farm Mutual Insurance Company, State Farm Bank, the PBS Foundation and is Vice Chairman of the Smithsonian National Board and the Utah Museum of Fine Arts. Al also is a director at Second Curve Capital. Al’s earlier work included leading Bank of Hawaii through the financial downturn and achieving recognition by Forbes Magazine’s as the “Best Bank in America” in 2009 and 2010. At Bank of Hawaii Al served as Chairman, CEO and President, following terms as the head of operations, finance and risk. After finishing his work at Bank of Hawaii, Al helped form a private investment fund for community banks. In his first career, Al was a CPA and Partner with Ernst & Young, where he served a wide range of business and nonprofit organizations as an auditor and advisor. Al served in six EY offices and specialized in serving community and regional banks and other financial institutions. Al retired from EY and joined First American Bank in Nashville as CFO. Previously Al served as Chairman of the Board of Regents of the University of Hawaii and HMSA, Hawaii’s Blue Cross/Blue Shield provider. He also was a director at the Research Corporation of the University of Hawaii and president of the Hawaii Bankers Association. Al served as a director of MidFirst Bank, the Federal Home Loan Bank of Seattle and several other organizations. In 2015, he was nominated to serve on the Board of Governors of the Federal Reserve. The Senate Banking Committee did not take up his nomination. Al is a graduate of Iowa State University. He and his wife Sue reside in Millcreek, Utah. They have two adult children and five grandchildren. Mr. Landon has served as Chair of the PBS Investment Committee and served on the Audit, Finance, and Nominating and Corporate Governance committees and Strategic Planning Advisory Group. He previously served as chair of the Audit Committee.